The soundtrack of “Out of the Darkness” is composed by Markus Aust at Chez Muziek adapting original Nepal instruments compositions by Prem Rana (Autari) who is an internationally awarded Nepali flute masters of our times. I met Prem last week in Belgium during his Europe 2010 Tournee with his group Sur Sudha. He handed over to me the recordings he had composed for the film in Kathmandu. 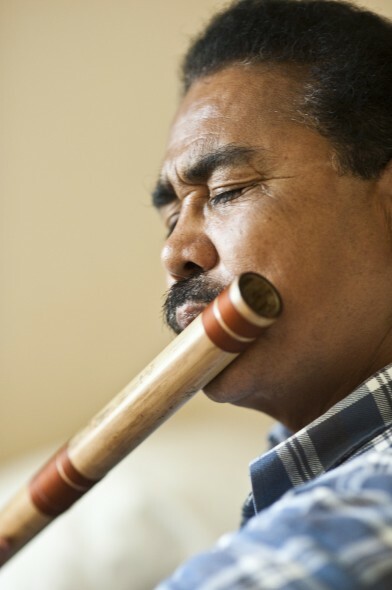 The bamboo Flute is not the only instrument that will be heard in the film. A whole range of authentic Nepali instruments which are used by different ethnic groups and communities are part of the soundtrack! This really is a project where East meets West. As for American Dr. Geoff Tabin meeting Nepali Dr. Sanduk Ruit to change people’s live overnight also the soundtrack of the film will be a melting pot of Eastern and Western atmospheres, and I am very anxious to see and listen the final result! This entry was posted on Saturday, September 18th, 2010 at 11:26 AM. It is filed under News and tagged with news. You can follow any responses to this entry through the RSS 2.0 feed.